Drakkar returns with their third album, Razorblade God. They hail from Italy which has certainly become a hotbed for new metal acts over the past few years. Razorblade God showcases some fine moments for the band, but I feel some improvements must be made if they want to establish themselves on the power metal scene. Drakkar play melodic power metal which is accented in places by keyboards. The production is much better than the low budget jobs you will find on many Italian metal albums. The sound is crisp and each instrument is turned to the correct level throughout the album with the keyboards used sparingly, but in just the right places to add to the songs. Of course, Drakkar isn't approaching the level of Edguy, Rhapsody, or Blind Guardian when it comes to prodcution, but they are certainly better than most of their Italian counterparts. 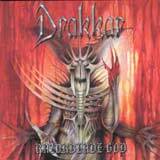 Nice guitar solos and tight riffs are always a plus for me, and Drakkar deliver plenty of both. I also enjoy the keen sense of melody Drakkar has. Each song has an identifiable melody that makes each song identifiable after just a few listens. The majestic chorus lines of To The Future, The Next Generation, and the title track in particular are enough to send chills up your spine. Unfortunately, the vocals are at times enough to send chills up my spine, but I will elaborate on that a bit more. As far as I am concerned, the vocals lines (both lead and backing) are what will hold Drakkar back from becoming a major metal act. Sure, the melodies, production, and musicianship are providing a solid backbone for the sound, but the vocals….arghh! The lead vocal delivery is very tense during the first half of the album which absolutely does not fit the majestic style of music Drakkar play. This tense delivery leads to a few out of tune moments (not horribly, but they are noticeable) as well as some high notes that are evidently a struggle (To the Future is a great example). At times, you will hear backing vocals and simply wish they were not there. Take Man and Machine for example: an otherwise melodic and majestic gem spoiled by harmony vocals that are not harmonious- someone is way out of key here! Somehow, the second half of the album features songs with less obvious vocal flaws which is very encouraging. The ballad, Galadriel's Song features an emotional and technically sound performance behind the mic, so there is plenty to hope for on the next Drakkar album.